In a sentence, the answer is: Give your child any necessary guidance but do not do the work for him. This is difficult advice to follow, I know. With our experience and know-how, we parents could do a bang-up job on the project. And it is difficult to watch a child struggle (even a little!) as he muddles through. But if adults take over, children don’t practice and hone skills. As a former preschool and kindergarten teacher, I have some suggestions for helping your help your child in just the right way! Take a look at the assignment with your child. Does it seem reasonable for a child his age? Does your child understand what he is being asked to do? Get some clarification from the teacher if there are concerns or questions. Children will often need help gathering the appropriate materials for the project. Getting ready to start can sometimes be overwhelming for little guys. So, along with your child, collect the materials and tools he will need and let him make those decisions. You make think that the larger shoe box is perfect, but he likes the smaller one. You might ask him to explain how he will use the materials he is choosing, if you feel he is making a mistake. But let him have the final say, since this is his project! Allow him to work independently. This can be difficult for parents, but if he is set up for success, he should be doing fine! Checking in just lets your child know that you are interested and also gives him an opportunity to get a little advice if he has run into a problem. As he is working and after he finishes the project, praise his efforts. Certainly the finished product will look different than if you had helped, but the process of working independently and completing the work is most important here. Of course, your child will also be happy to hear that his work was well done. Point out specific aspects that you appreciate and let him know. Children take great pride in tackling a project and seeing it through to the end. When parents take over, they rob their child of this satisfaction. – Instead of learning to be independent, a child will learn that his parents believe he is not capable of doing this project on his own. His confidence will be undermined. – The teacher knows! Teachers (and the other students) can tell that a child had adult help with a project and this can be uncomfortable for you child when he presents the project to his class. – Any high grade that the child gets will not feel good to him because he will know that he did not really earn it. – Your child will miss the opportunity to practice problem-solving skills and other skills, as well. 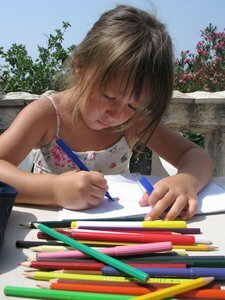 For information on helping your child develop important school-readiness skills, please visit Renee at www.schoolsparks.com for a kindergarten readiness test and free kindergarten worksheets including compare and contrast worksheets and color words worksheets. Related What Should You Give your Kids for Snack? Great tips! I remember helping my oldest with school projects when she was in grade school. Now that she is in high school if she brings home a project she usually gets it done without our help.